Coming up with unique fathers day gifts can be a challenge. After all, there are only so many belts, ties, and homemade coupons one dad should have. While he is sure to appreciate and cherish whatever comes his way on a day that's meant to celebrate him, it is always a plus to be able to give him something he can enjoy for years to come and this is why sewing your own gifts for dad is such a good idea. Putting your own heart and soul into a gift for him is something he won't soon forget. In fact, he'll probably be really touched that you put so much trouble into something made just for him. If your father is like most others then he probably spends plenty of time with the grill, especially during the summer months. With nothing more than a sewing machine, some material of your choice, and some thread, you can custom design an apron just for him that can't be found anywhere else in the world. Incorporate his favorite colors and designs and he'll use any excuse to put it on! Dads usually love to do their own home repairs and small projects. Many projects require the use of nails, so a sewn nail pouch could be the perfect gift. All you need is some durable and thick fabric such as canvas or denim, some thick thread, and some imagination in order to complete this gift. Cut out a piece of fabric that's about a foot and a half long and a foot tall, stitch the edges, and then sew on some pockets for the nails to fit into. Sew a long piece of fabric (about four feet long) along the top of the pouch so that dad can tie it around his waist. Decorate the pouch with cool saying, pictures of hammers, or your dad's favorite pet. 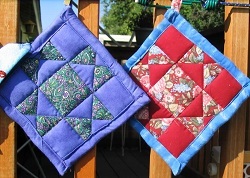 Offering unique fathers day gifts such as throw pillows will keep dad comfortable during the sports games and while watching movies in the evening. All you have to do is cut two pieces of your favorite design out of some material and then sew them together to make a pillow but leave a small section open so you can fill it with cotton. Once it's filled up, simply sew the hole closed and you should be left with a small, comfy throw pillow in the shape of whatever is your pleasure. Some popular shapes are footballs, remote controls, and ties. When you cut out your shapes make sure you cut them to be bigger than you want the pillow to end up, because when you sew them together some of the size will be taken up in the seams. Make Dads day real special this year. Give him something from both your heart and your hands.